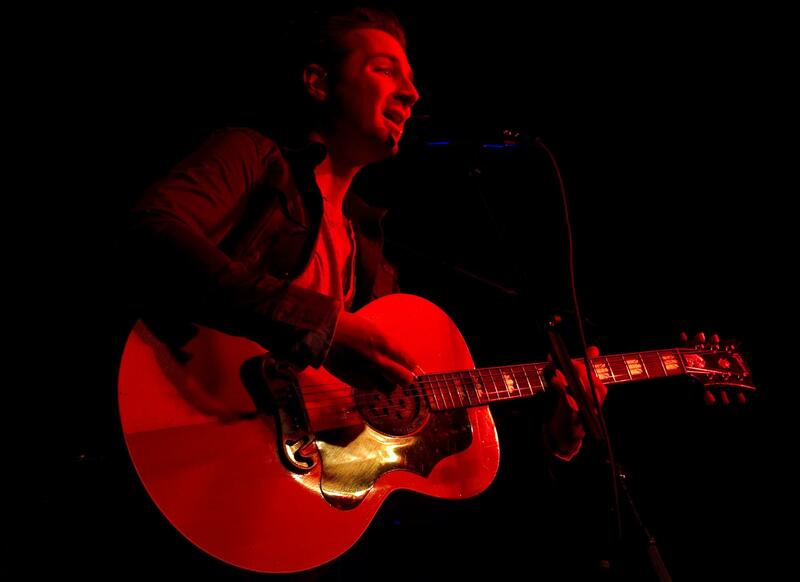 Serenade's John Vesely plays Sacramento's Ace of Spades sans band on March 19. John Vesely, better known as the one-man band Secondhand Serenade, performed a captivating nine-song set to a packed crowd of “emo-ites” at Sacramento’s Ace of Spades club on March 19, 2012. Vesely is a lot of things, but insincere he is most certainly not. Vesely, the spawn of a family of musicians, began his musical career at the age of 12 by spending eight consecutive years playing bass guitar in a variety of Bay Area acts spanning genres that included ska, rock and pop. Keeping abreast of current trends in music is certainly a strong suit for Vesely, who ended his heart-breaking ballad “Broken” by transitioning it into the final couple stanzas from nation’s current number one song “Tonight (We Are Young)” by up-and-comers .fun. After his marriage fell apart, Secondhand Serenade created their trademark album “A Twist In My Story” which maintained an emotional depth by detailing loss rather than love. By emphatically repeating the chorus “Will you stay away from me?” during his mid-set rendition of “Stay Away,” Vesely reinforced that heart-on-his-sleeve willingness to record and perform songs that are not only personal but life-altering for Secondhand Serenade’s ardent fans. The pseudonym Secondhand Serenade was created by the still-autonomous Vesely who wanted his “serenades” to be heard “second-hand” by an audience who rapidly discovered the uniqueness of Serenade’s auditory styling. Serenade manages to keep a sense of humor about being part of the emo [shorter and much cooler than spelling-out emotional] genre defined in part by bleeding heart songs. Near the end of the set, Vesely brilliantly played a cover of a song that — unless you were privy to his set list — would send shivers down your spine. After performing songs where he vigorously sang along to the beat of his own acoustic guitar-driven songs, Vesely tackled not Jimmy Eat World, John Mayer or Sinead O’Connor but Enrique Iglesias? Indeed Serenade did wearing a sardonic smile and it was show-stoppingly superb! Finishing his performance with Serenade’s most popular song “Fall For You,” Vesely set down the guitar for the first time that evening and led the eager crowd in an impressive sing-a-long while lightly maneuvering through the piano-driven ballad. Both rockers Velvet Revolver and Canada’s pop princess Avril Lavigne have a hit song entitled “Fall To Pieces” which melodically detail falling to pieces. The songs could just as easily been written by Vesely and would fit nicely into his repertoire. It’s Secondhand Serenade’s rigorous singer-songwriter style of straight forward music that distinguishes Vesely and makes it hard for anybody to not fall for him. Final verdict: Loved it? Loathed it? Missed the Mark? – Loved it! I met a number of ARC students that night so all of you let me know if I’m on target or not. It’s your responsibility to let me know whether my critiques “Miss the Mark.” Send me your feedback to [email protected] or follow me on Twitter @kingmlew – I want to hear from you! Be the first to comment on "Secondhand Serenade rivets Sacramento audience who can’t help but fall for them"